Indoor mini-trampolines have developed a following in recent years with the introduction of indoor trampoline exercise programs like Urban Rebounder. Unfortunately, the bouncy surface and springs lend themselves to bumps, bruises, twists and sprains. In fact, due to the risk of injury to children, the American Academy of Pediatrics recommends parents never purchase trampolines for the home, regardless of whether they are inside or outside trampolines. Mini-trampolines are often used by adults as a form of aerobic exercise. Whenever you are using a trampoline for exercise, you need to make sure you are wearing appropriate athletic shoes, and that you gradually increase the difficulty of the exercises you perform. Initially, you may not feel comfortable with the reactionary response your muscles make to "catch" you after you jump into the air--especially when the trampoline surface "gives" underneath your feet. Start with a safety jump, keeping your feet engaged with the surface of the trampoline as you bend your knees and press up and down on the trampoline. Purchase a trampoline that has a handrail you can hold to keep your balance while performing the exercises. 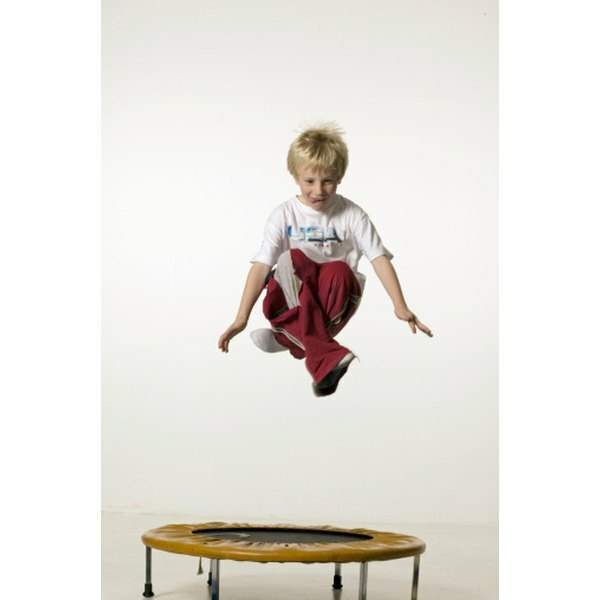 According to the website HealthGuidance, trampolines can be therapy for children with autism or sensory integration disorders. But, because the risk of injury on trampolines is so high in children, and because the American Academy of Pediatrics suggests parents never purchase trampolines for children, consider enrolling your child in a supervised class. Some children's therapy clinics and many gymnastics facilities offer indoor trampoline options and progressive, well-supervised instruction to keep kids safe. If you choose to purchase a trampoline for indoor home use, some features will make it safer. Choose a trampoline that has a safety cover over the springs. Choose a trampoline with a handrail to hang onto for balance. If you purchase a trampoline that folds up for easy storage, make sure there's a function that allows you to lock the trampoline open when in use. You don't want it to collapse while you jump. Always store mini-trampolines in a place inaccessible to children. If you are allowing your children to use the trampoline, make sure they only use it under direct supervision of you or another adult. Only allow one person on the trampoline's surface at a time. Always inspect the springs and jumping surface before using a trampoline to make sure no obvious signs of wear, rust or rips are present. When jumping on the trampoline, try to stay in the center of the jumping surface, jumping straight up and down to decrease the likelihood of falling off the edge. In 2006, more than 650,000 trampolines were recalled due to serious injuries incurred while setting the trampoline up. Even though you can't purchase these in stores, think twice about purchasing mini-trampolines from second-hand shops or garage sales. You wouldn't want to inadvertently purchase a dangerous piece of equipment.